In keeping with Labour’s tradition, our manifesto aims to Put the People First. It is a well thought out, forward looking document that endeavours to redeem the pain and suffering inflicted on our people through the misrule and insensitive policies of a dictatorial regime. The manifesto focuses on meeting the needs and aspirations of the masses- the poor, the workers, farmers, villagers and those in rural and peri-urban settlements. Attention is also given to those engaged in small businesses and self-employment ventures. These are shocking statistics and a damning indictment of a government totally indifferent to the plight of the people. In his propaganda meetings around the country, funded at tax payer’s expense, Mr. Bainimarama keeps denigrating past politicians blaming them for the shortcomings and ills of his regime. He would do better if he were to look at his own appalling record in office. He has been self-appointed prime minister of Fiji for eight years – that is almost twice the term of a normal government. What is worse – while the cost of living rose sharply through these policies, the regime failed to cushion its adverse impact on low income workers by refusing them just wage increases. On several occasions, under pressure from employers, it withheld pay increases awarded by the Wages Councils to unorganized workers. When increases were eventually approved, they were so reduced as to provide little relief to workers. The result of such anti-social policies is clear: half our people today live in poverty compared to one-third in 2006 – when Bainimarama grabbed power. Labour’s manifesto addresses these problems through a holistic and integrated approach. But we recognize that we cannot deliver on our social policies, until we rebuild our tattered economy. To do this, we will need to first restore the confidence level of our people, as well as investors, in Fiji’s future. However, given the prevailing situation, manifestos and policy platforms of political parties can only be relevant if Fiji is able to return to genuine parliamentary democracy and the rule of law. This makes the September polls the most crucial in our nation’s history. Our country today stands at a critical crossroads – the choice we make come September will decide the future of our beloved nation. As I have said in my message in the manifesto, this election is about democracy vs dictatorship – are we to move towards a prosperous, progressive society that protects the human rights and fundamental freedoms of our people? Or, will you vote for a party that will keep you shackled to the repressive rule of the past 8 years? Take note that under the regime’s 2013 Constitution – the decrees that deprive you of human rights, and the rights of workers and trade unions, continue in force. Vote these people back into power, and it will be business as usual. Remember, those who have stolen your freedom are not likely to hand it back to you on a platter! They have tasted absolute power and they want to keep it that way. They want it to be business as usual. No accountability, no transparency, no disclosures, no questions asked. And to keep it that way they trashed the Ghai Commission’s draft constitution because it required strict compliance with the principles of good governance and held governments accountable to the people. They substituted it with a handcrafted version of their own constitution designed to perpetuate the status quo. But they did not stop even at that. In order to completely seal the deal for themselves, Bainimarama and Khaiyum Inc . decided that they needed to go a step further and substantially manage the electoral process itself. It would be good to have a lame Electoral Commission, and a compliant Supervisor of Elections. The relevant decrees can be amended or abandoned as the situation warranted. Their plan is working to perfection. With a completely overhauled electoral system, redesigned ballot papers with numbers only – no symbols or names; the whole country converted into one single constituency, and a one-day poll and tight time lines, there will be utter chaos and confusion, come the polling day. Thus the electoral process was manipulated in numerous ways to ensure a particular outcome, beginning with the insistence on holding a one-day poll, despite all odds. On P4 of our manifesto you will find more details on why the 2014 electoral process lacks integrity and may not be seen as free, fair and credible. One of the most serious, is the manner in which the voter registration process is being manipulated. It began in 2012 with the promulgation of the Electoral (Registration of Voters) Decree No 54 which surreptitiously removed the minimum residency qualification for registration as a voter. As in other cases, no explanations are ever given for the changes brought in. They are slipped in without any publicity. Now, I ask: what is the rationale for dropping this minimum residency requirement? The right to vote must originate from a person’s residency and citizenship of a country. I am not aware of any other country in the region that does not have a minimum residency requirement for registering as a voter? On a related matter, I must also raise concern on reports that Fiji passports are being sold in the US and Hong Kong for a fee, ahead of the elections. Then there is the sudden, unprecedented announcement by the Immigration Department a month ago, that it was undertaking overseas visits to issue new Fiji passports. As voters, you may well ask what is happening? Just last night I was told there is yet another change to the electoral decree. Having removed the 2-year minimum residency qualification for registration as a voter, the regime has now brought that in as a restriction for those wishing to contest the elections. So you see how once again the process is being manipulated to suit the regime’s agenda. What can be more alarming to opposition parties and the people generally than to know that Fiji First candidate and party secretary-general, will continue to exercise ministerial oversight of the electoral process? How then can one, under such an environment of obvious manipulation and total disregard for ethical behaviour, expect the elections to be free, fair and credible? It doesn’t help at all that the media continues to exercise restraint in reporting on important issues that reflect on the credibility of the polls. A number of our statements questioning the process have been ignored by the mainstream media. I would like to make it very clear that the local media has a duty to the people which must override its commercial interests. The media will be failing in its duty to the nation, if it willfully ignores developments that are questionable, and, potentially dangerous enough to inflict a rigged election on the people. This then, friends, is the backdrop against which the nation is required to go to the polls. Bainimarama’s game plan is obvious: to acquire legitimacy by returning as elected prime minister. But, if you make the mistake of electing him to office, you would be helping legitimise a constitutional dictatorship. Let’s now look at the record of this man who having usurped power at the barrel of a gun in 2006, is now seeking your mandate to become an elected prime minister. This man who once told an ABC reporter that he doesn’t trust the people to make the right decisions – went to the trouble of manipulating the electoral process to make sure his team gets in. The question before the voter now is: Can you trust such a person? In normal circumstances, he would have been thrown out after the first five years – because his administration had achieved nothing in that time. Public dishonesty has been a hallmark of this so-called leader. While Bainimarama discredits all past politicians as “liars”. He fails to look at his own dismal record. His entire term in office has been littered with a litany of lies, and one broken promise after another. 1. At the time of the takeover of government on 5 December 2006, he promised that he would continue to receive just one salary, that of the Army Commander and not the PM’s pay. That promise went by the wayside. The lure of the dollar broke that resolve. You are all aware of the saga of the PM’s salary. From early 2010, Cabinet salaries became top secret. They were taken from the oversight of the Treasury and put under the responsibility of a private Suva accounting firm with close connections to the Attorney General. There have been reports that the PM and his AG were being paid super salaries in the range of over $1m a year. Repeated calls by the Labour Party for the two to disclose their true salaries, got no response. There was absolute silence on the subject until they announced their intention to register the Fiji First Party to contest the elections. Under the disclosure requirements of the Political Parties Decree, they were required to reveal their incomes. What the public received was a tiny, minute notice in the Fiji Sun stating the PM’s total salary at $278,750. No other details were given. Of course, no one believes the stated salary. Labour called on the two to provide audited accounts of their salaries, duly certified by the Auditor General and the Permanent Secretary Finance, going back to 2010. There has been absolute silence since then. The two are very quick to point a finger at others – demanding transparency and accountability from everyone but themselves? Why are they playing a game of public deceit when it comes to their own conduct. 2. 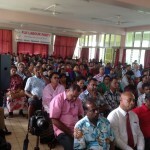 Bainimarama undertook to uphold the 1997 Constitution and hold general elections in 2009. Yet, in 2009, he abrogated the Constitution and deferred elections for 5 years to 2014. 3. He said no one from the Army would benefit from the 2006 coup. Yet, Army officers are today holding top positions in public administrations at salaries that are way above those paid for these positions pre-coup. They have been sent to serve in Fiji missions overseas and appointed as members of statutory authority boards. State consultancy and public works contracts are being handed out without proper procedures being followed. There is the case of the prime minister’s salary and the lease on State land in Bayview Heights given to a foreign company in blatant breach of proper procedures. A number of letters written to the Lands Department, the Suva City Council and FICAC on the scam surrounding the lease has elicited no satisfactory response. I have cited documents that show that the approval for the lease of the land came directly from the Prime Minister’s office. And that the lease was granted for an absurd annual rental of $100. This is how prime State land is being alienated to foreigners for a farthing, so to speak! But there may be other considerations behind this transaction unbeknown to the people! Questions are also being asked about the lease of State land in Raiwaqa; and how Fiji First has managed to acquire assets of lamost Half a Million dollars in the short time since its registration? 5. Let me cite one more example of Bainimarama’s broken promises. In 2012 he promised that the constitutional process would be inclusive and participatory, reflecting the will of the people. The regime’s 2013 Constitution is too seriously flawed to accepted as the supreme law of the nation. On Page 4 of our manifesto, we explain why it must be rejected. It merely entrenches the status quo and the absolutism of the past 7 years under the regime. All harsh decrees enforced since 2009 continue in force, overriding the human rights provisions of the constitution. Civil, political, human and trade union rights embodied in the Bill of Rights are effectively derogated with the continued enforcement of these repressive decrees. It concentrates wide powers in the hands of the Prime Minister and the Attorney General to the exclusion of check and balances against abuse of such process. It lacks adequate provisions for accountability and transparency which are the pillars of good governance. Most importantly, it does not observe the doctrine of separation of powers between the executive, the legislature and the judiciary. The judiciary remains compromised with the Attorney General retaining influence over the appointments of judges, magistrates, the Chief Justice, the Solicitor General and the Director of Public Prosecutions. On the question of judiciary, I take absolute umbrage over a remark made by the Prime Minister at a political meeting in Tailevu on Thursday night. Speaking in Fijian, he told the meeting , “Mahendra Chaudhry and Laisenia Qarase will never return to Parliament” (or words to that effect). I would like to ask the Prime Minister: how can he say with so much certainty that I will not return to Parliament? I have an appeal pending against my conviction and sentence. It has not been heard yet. I am indeed grateful to the Court for granting my request for an urgent hearing on the matter. If my appeal succeeds then the conviction goes and I can contest the elections and win I most certainly will! How then can the Prime Minister state with so much conviction that I will not return to Parliament? What does this imply? Indeed, this is not the first time he has gone public with a statement that I would not be contesting the general elections. My case is before the Appeals Court and therefore, I am constrained from speaking further on the issue. However, I have always maintained that the charges against me were politically motivated to stop me from contesting the 2014 general elections. I pose this question to Mr. Bainimarama: if you are so confident of your support among the people of Fiji, why are you going around eliminating all serious threats to your winning the elections? Mr Laisenia Qarase was removed from contesting the election and now I am being targeted – both of us, former prime ministers and leaders of strong, mainstream political parties. The concern of our people at the increasing number of foreigners that are being allowed into the country under questionable arrangements to take up jobs and businesses that should remain in local hands. They are setting up in unfair competition to our own businesses and are being willy nilly offered citizenship rights. There is an influx of foreign workers who are taking jobs away from our own people. Take the case of the hundreds of PWD workers who were laid off. Some of them were taken back , I know, but by and large they were replaced by foreign workers. Our own workers have now become numbers on the list of the unemployed. Our manifesto refers to this and we have outlined policies to address the situation. This should be a worry to every right thinking citizen, because ultimately it raises questions of our sovereignty. Our nation, our workers may be under threat from the influx of foreign workers and businesses with questionable records. We are also concerned at the rate at which our passports are being sold for a song. Citizenship should not be conferred on outside for the asking. Let me make it clear that the Labour Party welcomes foreign investors who wish to genuinely invest here and help us grow our economy and provide jobs for our people. They will be given all encouragement and assistance. But we certainly are wary of those who wish to come here with a hidden agenda. Our voters need to consider the long term implications of these policies when they decide who to cast their vote for. There are things happening in this country that are not right for the long term future of our nation. When you cant hold anyone accountable, how can you stop them from implementing policies that threaten the security of our nation? The only way they can be stopped is at the polls. Do it before its too late! I have highlighted to you the dismal record of the Bainimarama regime after 8 years in office. 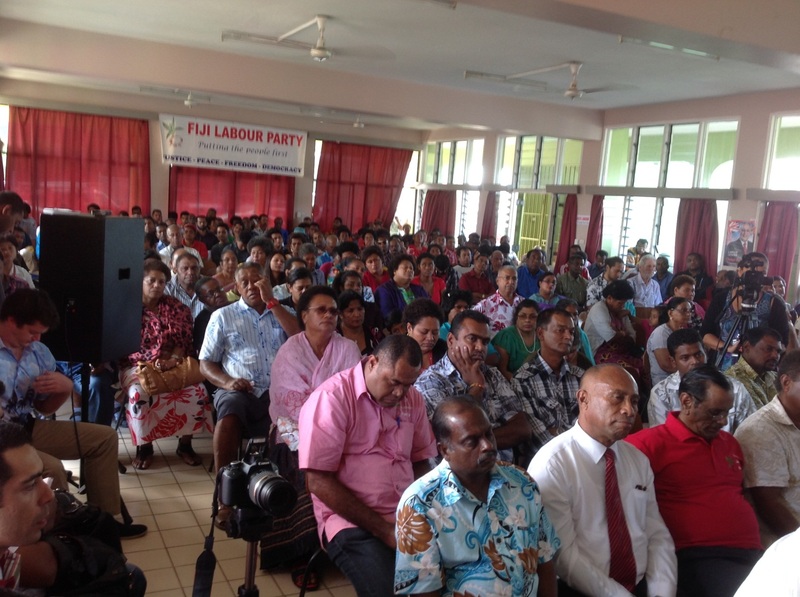 Let me now talk about the Fiji Labour Party and our plans for you. Labour’s Manifesto 2014 presents to you its vision for revitalizing our nation after 8 years of neglect and misrule. We have stood by and watched our people suffer under the regime’s insensitive policies. We have been appalled by the violation of our rights and freedoms, many of which were secured after long hard struggles over many years. Your own leaders had participated in many of these struggles. As someone who spent the best part of his life fighting for the rights of our farmers and workers, I have been deeply aggrieved to see these rights removed with just a stroke of the pen. Labour’s manifesto deals at length with the politicisation of the civil service and outlines in some details how we plan to right these wrongs. Labour has an established record of delivering on its promises .